How Much Better Is SQL2008 Full Text Index Performance vs. SQL2000? Wow… (Rows #’s are different because of different database backups). I know SQL2000 relied on the Windows Search Service and this functionality and related catalogs became integrated once SQL2005 was released which helped immensely. So this is probably not any big news for 90% of folks out there, but if you are still on SQL2000 and need something to look forward to, well here it is. Why Does My .NET Setup Package Project Not Create the Setup.exe and Only Makes a .msi Package? However the problem I ran into before finding the work around was that my "Release" folder for my setup package project was only generating the .msi setup package and not the Setup.exe as well. This was strange to me as all of my other projects contained the Setup.exe package alongside the generated .msi package. I figured out the reasoning why the Setup.exe package is (or is not) generated. 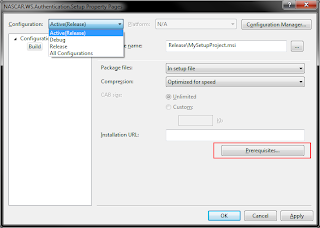 It has to do with selecting the option in the setup project's properties to create a "Prerequisites" setup package as well. 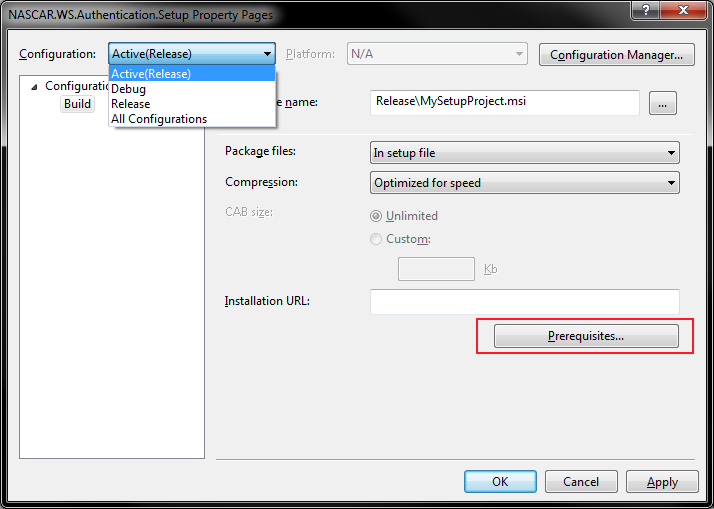 Selecting this option (I believe it is selected by default when adding a new setup and deployment project to your solution) is what triggers the creation of the Setup.exe package. 2nd, take note of the "Configuration" dropdown value. In my case things were really messed up as I had the proper selections for "Debug" and it was "Release" mode that was incorrectly configured. Check both to make sure you have it correct. 3rd, press the "Prerequisites..." button displayed above in the property pages. 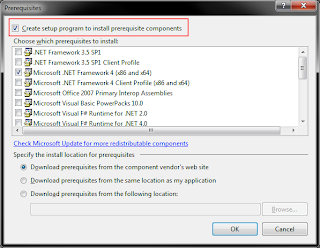 Take note of selecting the appropriate .NET Framework version or any other required prerequisites, and select "OK" and the "OK" again to close the dialog box. 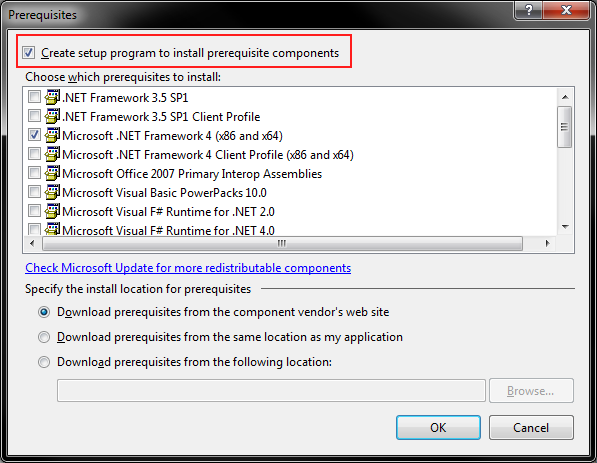 Rebuild the setup package and then navigate to its build directory (or use "Open Folder in Windows Explorer" feature by right-clicking project in VS.NET 2010: pictured below) to verify the Setup.exe package has indeed now been created.